Soil organisms are essential for building soil organic matter and keeping plants well supplied with nutrients because they break down organic matter. These organisms make nutrients available by freeing them from organic molecules. Some bacteria fix nitrogen gas from the atmosphere, making it available to plants. Other organisms dissolve minerals and make phosphorus more available. If soil organisms aren’t present and active, more fertilizers will be needed to supply plant nutrients. A varied community of organisms is your best protection against major pest outbreaks and soil fertility problems. A soil rich in organic matter and continually supplied with different types of fresh residues is home to a much more diverse group of organisms than soil depleted of organic matter. This greater diversity of organisms helps insure that fewer potentially harmful organisms will be able to develop sufficient populations to reduce crop yields. By building soil organic matter, soil has a favorable physical condition for growing plants, it is said to have good tilth. Such a soil is porous and allows water to enter easily, instead of running off the surface. More water is stored in the soil for plants to use between rains, and less erosion occurs. Good tilth also means that the soil is well aerated. Roots can easily obtain oxygen and get rid of carbon dioxide. A porous soil does not restrict root development and exploration. When a soil has poor tilth, the soil’s structure deteriorates and soil aggregates break down, causing increased compaction and decreased aeration and water storage. A soil layer can become so compacted that roots can’t grow. A soil with excellent physical properties will have numerous channels and pores of many different sizes. Studies on both undisturbed and agricultural soils show that when building soil organic matter, soils tend to be less compact and have more space for air passage and water storage. Sticky substances are produced during the decomposition of plant residues. Along with plant roots and fungal hyphae, they bind mineral particles together into clumps, or aggregates. 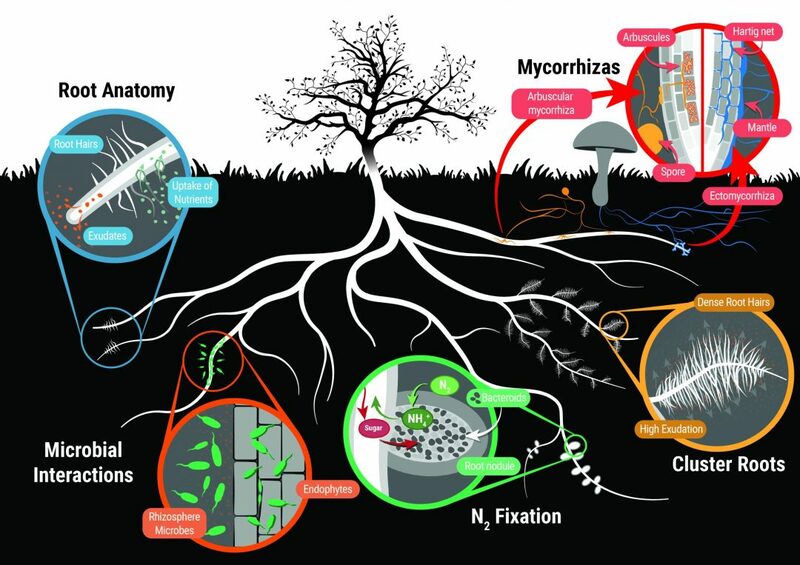 In addition, the sticky secretions of mycorrhizal fungi—beneficial fungi that enter roots and help plants get more water and nutrients—are important binding material in soils. The arrangement and collection of minerals as aggregates and the degree of soil compaction have huge effects on plant growth (see chapters 5 and 6). The development of aggregates is desirable in all types of soils because it promotes better drainage, aeration, and water storage. The one exception is for wetland crops, such as rice, when you want a dense, puddled soil to keep it flooded. Building soil organic matter, as residue on the soil surface or as a binding agent for aggregates near the surface, plays an important role in decreasing soil erosion. Surface residues intercept raindrops and decrease their potential to detach soil particles. These surface residues also slow water as it flows across the field, giving it a better chance to infiltrate into the soil. Aggregates and large channels greatly enhance the ability of soil to conduct water from the surface into the subsoil. Most farmers can tell that one soil is better than another by looking at them, seeing how they work up when tilled, or even by sensing how they feel when walked on or touched. What they are seeing or sensing is really good tilth. For an example, see the photo on the back cover of this book. It shows that soil differences can be created by different management strategies. Farmers and gardeners would certainly rather grow their crops on the more porous soil depicted in the photo on the right. Since erosion tends to remove the most fertile part of the soil, it can cause a significant reduction in crop yields. 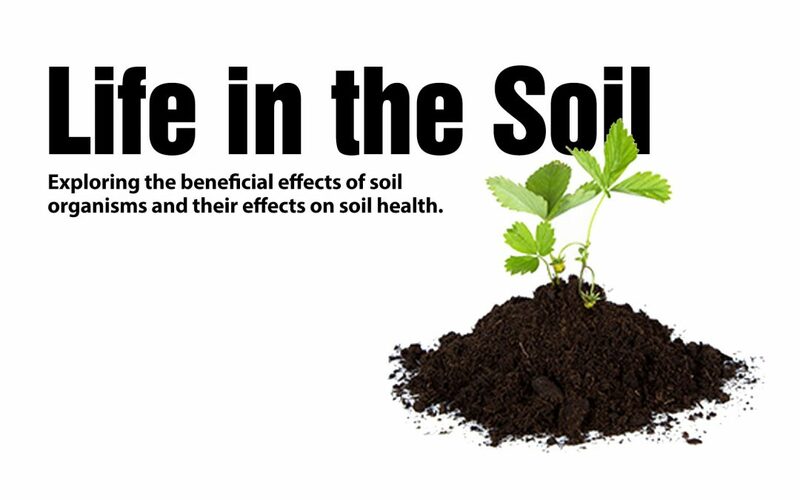 In some soils, the loss of just a few inches of topsoil may result in a yield reduction of 50%. The surface of some soils low in organic matter may seal over, or crust, as rainfall breaks down aggregates and pores near the surface fill with solids. When this happens, water that can’t infiltrate into the soil runs off the field, carrying valuable topsoil Large soil pores, or channels, are very important because of their ability to allow a lot of water to flow rapidly into the soil. Larger pores are formed in a number of ways. Old root channels may remain open for some time after the root decomposes. Larger soil organisms, such as insects and earthworms, create channels as they move through the soil. The mucus that earthworms secrete to keep their skin from drying out also helps to keep their channels open for a long time. Acids and bases are released as minerals dissolve and organisms go about their normal functions of decomposing organic materials or fixing nitrogen. Acids or bases are excreted by the roots of plants, and acids form in the soil from the use of nitrogen fertilizers. It is best for plants if the soil acidity status, referred to as pH, does not swing too wildly during the season. The pH scale is a way of expressing the amount of free hydrogen (H+) in the soil water. More acidic conditions, with greater amounts of hydrogen, are indicated by lower numbers. A soil at pH 4 is very acid. Its solution is ten times more acid than a soil at pH 5. A soil at pH 7 is neutral—there is just as much base in the water as there is acid. Most crops do best when the soil is slightly acid and the pH is around 6 to 7. Essential nutrients are more available to plants in this pH range than when soils are either more acidic or more basic. Soil organic matter is able to slow down, or buffer, changes in pH by taking free hydrogen out of solution as acids are produced or by giving off hydrogen as bases are produced.